P90X2 is Coming Soon. Here are the top 13 FAQ’s. Question 1. What happens if I don’t pre-order? Answer: Unfortunately, there is no guarantee you’ll be able to get a copy of P90X2 before 2012 if you don’t pre-order now. Question 2. What are the benefits of Pre-Ordering? Answer: Delivery by Christmas!! Credit Card won’t be charged until shipped! Get FREE Shipping! Get 2 bonus DVD workouts to compliment P90X2! Get into weekly drawing for P90X apparel & GRAND PRIZE… And Tony Horton may even deliver to your door! Question 3. How is P90X2 different from P90X? Answer: Consider P90X2 the next wave in applied science for body transformation. Like P90X, it’s a complete 90-day program, but with all-new, cutting-edge workouts grounded in the most modern thinking in sports science. It takes the principles of the P90X concept and cranks up the intensity with exercises that demand every ounce of your balance, agility, core strength, and athleticism. Question 4. When will P90X2 be available? Question 5. What’s included in P90X2? Question 6. 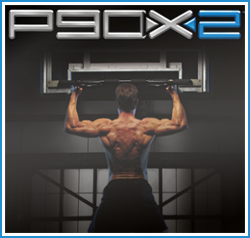 Is there an exclusive offer when ordering P90X2 from Extremely-Fit (Coach / Team Beachbody)? Answer: Yes, you get two FREE DVD workouts, P90X One on One: 4 Legs, and P90X One on One: Upper Body Balance, when you order from Extremely-Fit (Coach / Team Beachbody). Question 7. How do I order P90X2? Question 8. What types of exercises are in the program? Answer: Phase One focuses on your foundation. It includes X2 Core, which works the core using instability; X2 Balance & Power, which incorporates strength and explosive movements; and more. Phase Two focuses on strength with workouts like Plyocide, combining explosive movements with mind and coordination drills; Chest, Back & Balance, the mega pump of P90X Chest & Back with the addition of unstable platforms. Phase Three focuses on performance. It includes P.A.P. Lower and P.A.P. Upper, two separate workouts using a cutting-edge training technique used by some of the fittest athletes on the planet. These are a series of repeated movements or “complexes” that will absolutely destroy you. Question 9. What equipment do I need? Answer: All you need to do P90X2 is a couple of dumbbells or resistance bands, a place to do pull-ups, and about an hour a day. A pro grade stability ball, two 8-lb. medicine balls, and a foam roller are strongly recommended, too. Tony Horton has stated that you can modify P90X2 with just a resistance band. However, to get the full benefits of the program, additional equipment is recommended. But if you are on the road, there is no reason you can’t do P90X2 while you travel. Question 10. What if I want a less strenuous program? Answer: If you decide you aren’t ready to tackle P90X2 yet but still want to get in great shape fast, we recommend starting with a less extreme program, such as 10-Minute Trainer or Power 90. Beachbody® offers a wide variety of incredible fitness programs for all levels and goals, so you’re sure to find the one that’s right for you. You can also compare all of the various Beachbody programs here. Question 11. I subscribed to P90X® ONE on ONE Volume 3. How do I place my order? Answer: You can call customer service at 1 (800) 470-7870. Tell the service representative that you purchased ONE on ONE Volume 3 and you’ll be given further details. Question 12. Is the 50% off offer applicable to all of the P90X2 kits? Answer: Yes, the 50% off offer is applicable to the Base Kit price (DVD and Blu-ray), as well as the Base Kit portion of the total price of the Deluxe and Ultimate Kits (DVD and Blu-ray). The 50% off discount is only available if you previously ordered all 12 DVDs from the Volume 3 P90X One on One series. Question 13. When will my credit card be charged? Answer: As soon as the product ships, your credit card will be charged. Expect shipping to be the first or second week of December. P90X2 Review – X2 Yoga. Do I Hate It or Love It? Excuse me, I’m afraid you forgot to put Tony Horton’s powerstands in the ultimate kit pre-order pack. I noticed in your FAQ’s number 12, something about 50% off on all of the P90x2 kits. I pre-ordered on 9/1/2011 and got the impression my order was a little over $200.00 for the deluxe kit. How do I get in on the 50% off order? David, I added a little clarification to number 12. The 50% off discount is only available if you previously ordered all 12 DVDs from the Volume 3 P90X One on One series. I am glad though that beachbody doesn’t charge until shipping, since I make minimum wage I was worried I was going to miss out on everything. Thank you Beachbody. And thank you Robert for posting this awesome information.